The most recent cemetery story to go viral on the Internet concerns Antwerp, Belgium having approximately 5,000 secondhand graves for sale. How did this come about? Unlike America where burial grounds are either national, private, county, pauper or family owned, in many European countries the cemeteries are city property. Those entities sell “concessions” to people, allowing them to bury someone in the cemetery. However, use of the gravesite is not in perpetuity. Rather the plot is usually rented for 25 years. At the term end a family may release the grave and many do. If there is no renewal the city has the right to tear down the monument, move the remains to an ossuary and sell someone else the concession. Prices range from $1,360 to $4,080. All of this began in 1997 when Antwerp elected to destroy Albert Dumont’s place of rest. He passed away in the 1920s and the family had ceased paying a concession. 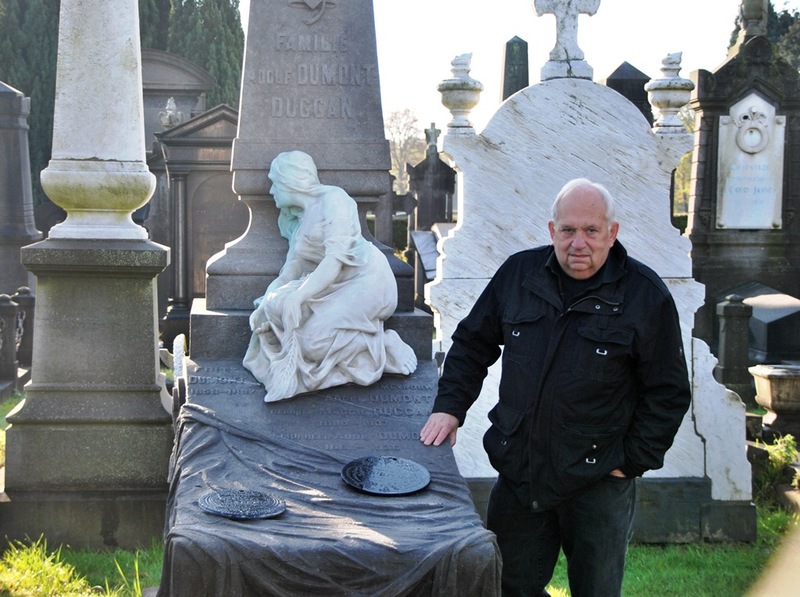 However, a civic minded citizen and graveyard fan, Jacques Buermans, convinced city fathers of the historic value of Antwerp’s cemeteries and sold them on the idea of leasing delinquent tombs to secondhand buyers. The idea caught on and over 120 graves have been resold. Buermans was first in line. He leased the former resting place of the Dumont-Duggan family in Schoonselhof Cemetery. It is a lovely white marble ledger with a column topped by a bronze bust of Dumont and marked with carvings of Freemasonry. A white marble mourner sits at the base of the column. Buyers must agree to several conditions including repairing the existing grave marker and only making minor alterations. However, when they pass away, they are allowed to place their name on the tomb.